In the last few weeks some truly inspiring women have reached out to me. 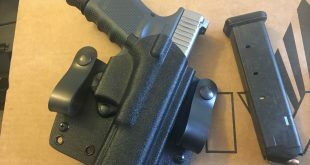 We recently did an article on Off Hand Gear run by Off Hand Sandi and how she is working to make shooting accessories more attractive to female shooters. We also have been in touch with Michigan Moms Against Gun Control another great organization that is made up of more then just moms. The article below is from a woman that has taken action to encourage female empowerment. Cammie Herrera is a from Toledo (Don’t hold that against her) and is a physical trainer and a licensed Bounty Hunter! She holds events at her gym the Body Factory teaching women the various non-lethal forms of defensive available to them. Though 248 Shooter is second Amendment blog we understand that force must be met with an appropriate response and that is not always a gun. In our EDC contest you may have seen even NRA trainers who carry pepper spray and stun guns as non lethal options for when a situation does not need lethal force. Cammie has written the below article and brings some staggering statistics to light. 75% of women are likely to fall victim to a violent attack at least once in their life. I have personally seen women who have been assaulted and then decided to learn how to empower themselves. The tone of this article and my advise is why wait until you have been attacked to prepare? Learn situational awareness and defensive techniques combined with a means of defense so you can be part of the %25 that never succumb to a violent assault. EQUIP women with products that can protect them! Most women have never held a stun gun and can’t tell you where to find one to see ,hold or purchase. We are changing that! 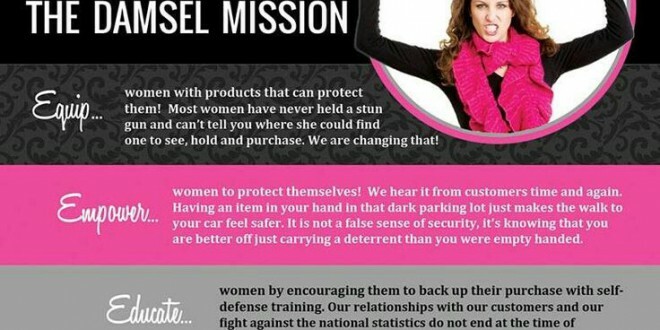 EMPOWER women to protect themselves! We hear it from customers time and again. Having an item in your hand in a dark parking lot just makes the walk to your car feel safer. It is not a false sense of security, it is knowing that you are better off carrying a deterrent than you were empty handed. EDUCATE women by encouraging them to back up their purchase with self-defense training. Our relationships with our customers and our fight against national statistics do not end at the time of purchase. I was licensed as a Bounty Hunter in 1998 and have had numerous trainings regarding self defense, I also am a personal trainer and hold these events at my gym the Body Factory in Toledo,Ohio. When I came across these products I immediately say the potential to empower women by offering these products combined with self-defense training. I didn’t want to just sell products without giving proper instruction on how to use them. After comparing Damsel in Defense products with other products in this category I was pleased to find out that they are the strongest on the market! Our pepper sprays are 18% OC & 2 million scoville heat units and a UV identifying dye that lasts for 7 days while others typically sold are only 10% OC with no UV identifying dye. We have kubaton’s for your keychain. Personal alarms that can be used by seniors, travelers, college students,people who live alone. We have an alarm for young children that alerts you when they are 3 -21 feet away to allow you the opportunity to “act fast” before they get too far from you.